1772 Penny Harold II Pax type B.M.C. 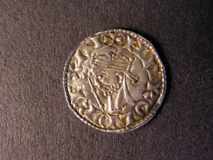 I, No.104 var S.1186 North 836 Wilton mint, moneyer Rentwine, weight 1.1 grammes, Fine/Good Fine with a slight weakness in the legends, Very Rare (bought C.J.Martin 1984 £345) There are 16 Wilton mint Pax types in the E.M.C. & SCBI databases, none of which are of moneyer Rentwine. 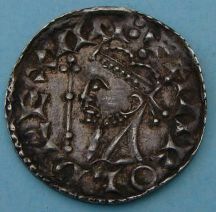 North appears not to record the moneyer in Volume I of English Hammered Coinage.